I thought I’d kick off this book blog with the most obvious topic, which is where the idea for the novel came from. This is perhaps the most popular – and certainly legitimate – question that most authors get asked about their work. And even though writers, including myself, will look a bit blank at first to explain it’s because the kernels of story ideas often arise from curious coincidences. That said I do agree that learning the conception of a story does make for interesting conversation. I’d recently delivered Fields of Gold, my first foray into historical saga. The question was pitched to me as a casual remark during a farewell chat as I was about to board a flight to Europe. I was looking forward to 21 hours of me-time to read for pleasure, to watch movies, to listen to music virtually uninterrupted. I was travelling alone and I was in Business Class. It wasn’t going to get any better for me! ‘Just scribble it on a napkin, Fiona,’ Bob said. He got me thinking. That flight was not as peaceful as I’d planned because my mind went into overdrive playing with the idea for a new adventure/romance that Penguin might consider a perfect fit for historical saga. Paris was part of my mental landscape that day. I love Paris, I dream Paris, and one day I’ll live Paris. But in the meantime any reason to visit Paris is a good one and I had the best – an invitation from my French publisher to be its guest for a week in the City of Love to attend The Paris Book Fair. Marvellous! So here I am, in Business, being waited on hand and foot, with a stupid grin that Paris was at the end of this but with my imagination subconsciously reaching toward a new story that I hadn’t yet conceived. At the back of my mind was a fast approaching visit from my parents to Tasmania, which is where I like to do a lot of my writing from. I wanted to have some fun trips in place for them to enjoy. And so I’d recently been googling madly to come up with options and had stumbled across Bridestowe Lavender Farm just outside Launceston. It looked beautiful and given that it would be in full blue roar during their visit, I couldn’t imagine something more suitable for my mother in particular to enjoy. I’d explored its website in depth and become deeply fascinated by Bridestowe’s history. Why was it so fascinating? Well, at around the turn of the previous century an English perfumer left London and arrived in Launceston of all places clutching a bag of lavender seeds that he’d harvested from the southern French alps. Not any old lavender mind you, this was true French lavender – which most believe is the finest and most pure of lavenders because it grows wild in a climate that experiences hot dry summers and very cold, wet winters. Provence offers this climate and only the Luberon offers the alpine nursery so pockets of wild lavender or ‘lavandula angustifolia’ if you prefer me to be precise can grow. Mr Denny had failed in Devon with his planting of French lavender so this really was a bit of a last ditch effort to be giving it a whirl in Lilydale on the other side of the world. They planted and in 1924 a sample was sent to London and pronounced ‘completely camphor free’. This was incredibly exciting and I’ll explain why in a different blog, and Denny believed this is because his site outside Launceston at 40 degrees south mimicked the landscape, altitude and climate of the Luberon region of 40 degrees north. Anyway, the Denny family began a lifetime of plant selection and cultivation as well as innovations in how to grow and where to grow. That’s coming close to a century ago but today Bridestowe lavender is some of the most coveted on the planet because is provides sumptuously high quality and super yield of that most rare of products – perfume quality lavender oil. (More on that in another blog.) Today perfumers from all over the globe jostle to get hold of Bridestowe oil because it is so pure and comes from the original French wild stock. Oh…which writer could resist this? You see it was this lovely story of the Dennis family’s farm now owned by the delightful Robert and Jennifer Ravens – who have done much to continue the farm’s progress and renown – but especially the notion of selling French lavender oil back to the French that stuck in my mind. And now it all comes together…I’m on the plane, reaching for a story, the lavender history is whirling around in my thoughts, I’m headed for Paris, I’m thinking very French and wondering wouldn’t it be fun to get down to Provence…and (gasp) bingo!….the storyline eased gently into place. By the time I hit Charles de Gaulle airport I was rushing to get to my hotel so I could scribble off that email to my publisher….how about a story of a young French lavender farmer from the Luberon in Provence whose livelihood is shattered and family savagely ripped apart by the onset of WWll and the arrival of the Nazis into France. He must leave his farm and all he can take is a bag of lavender seeds before he turns resistance fighter and makes a vow that one day he will plant those seeds in peacetime and once again walk his rows of lavender. It felt huge and romantic and heroic. I could already envisage the woman who would come into his life and the conflict was already there in the shape of the war and the Nazis who traumatised not only France but all of Europe. It really was irresistible and even though it felt thin at that stage I knew I was onto something. It seemed so did Penguin because I was deliriously happy to receive an email back the next day saying it would very much like to purchase this novel and could it have a synopsis as soon as I could write one. …and so it began. I walked the streets of Paris in 2009 with a Cheshire cat grin and a story in my heart that I knew was going to make an addictive tale. I hope you agree. The Lavender Keeper will release across Aust/NZ on March 26. 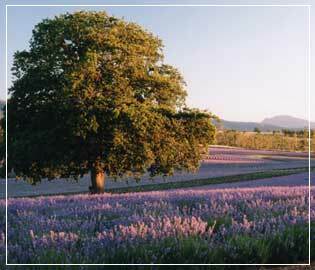 The image shows Bridestowe Lavender Farm and its famous century-old oak tree. Always interesting to hear how people come up with their ideas. It’s almost like the stars aligned and everything happened at the right time for you to think of this storyline. Thank you so much for doing this by the way Fiona…I’m loving it already and there have only been two posts!